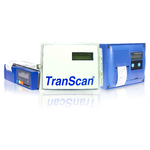 Seven Telematics proudly manufactures its range of Transcan® Temperature data loggers from their UK base. Undoubtedly the World’s most widely used road transport temperature monitoring device. Transcan products have been watching over cargo’s across the Globe for nearly 20 years. Seven Telematics combine the trusted format of Transcan® Recorders with state of the art technology in their SevenEye® Telematics Systems. Offering both standard vehicle tracking for “Dry Freight” vehicles and “Refrigerated Transport” via Live satellite link to their range of EN12830 verified temperature loggers. Transcan® Temperature data loggers (recorders) are undoubtedly the world’s most widely used road transport temperature monitoring device. They are manufactured in the UK and designed to prevent temperature critical consignments from spoiling. Record and store all temperature information from your consignment. Audible alarm in the event a preset temperature range is broken. Combined with SevenEye® the ability to remotely monitor the temperature of your cargo in real-time from any browser or smartphone. Immediate email and SMS alerts for out of range temperatures, switch events and power losses. We supply to both truck builders and end users. frozen and chilled food distribution, transport of animals, fresh produce and pharmaceutical distribution.